Welcome to CarryInterest amazon store. Start your good life with this tote bag from InterestPrint brand. This tote bag works well as a shoulder bag, travel bag, shopping bag, diaper bag, handbag and more. Suitable for using in work, travel, grocery shopping, nursing, school, camping, picnics, and other occasions. It is also an ideal gift for your family, lover, friend,classmates. Size: 14.57"(L) x 3.74"(W) x 14.17"(H) x 10.63(Hand Drop). Made of high quality canvas. One main compartment. Powerful capacity can accommodate most your everyday needs. Such as book, mobile, purse, cosmetic case, sunglasses, etc. 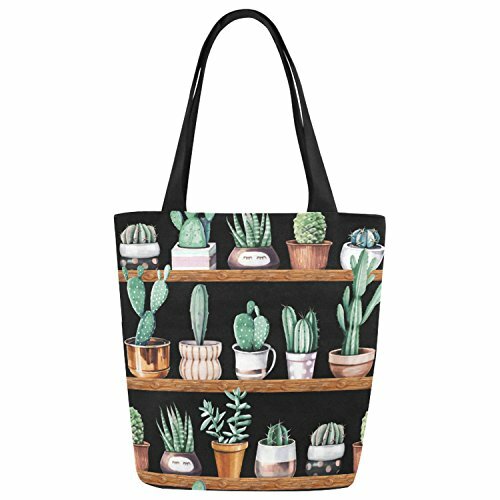 This is a fashionable and convenient tote bag. Personalized customization. The unique design makes you more confident, gorgeous and unusual. Two-sided printing, using advanced printing technology. Dimension: 14.57"(L) x 3.74"(W) x 14.17"(H) x 10.63(Hand Drop). Design: personalized customization. It will make you unique. Printing: using the advanced printing technology, two-sided printing. Function: this is versatile tote bag. You could use it for school bag, diaper bag, shopping bag and more. It is also perfect gift choice.